The book is illustrated by Justin Gerard of Portland Studios. It’s a beautiful story–because it’s a retelling of the biblical story of Christ atoning for our sins by drinking the cup of God’s wrath. Dr. Sproul is a gifted storyteller, and the art wonderfully complements the story. I recently had a chance to ask Dr. Sproul a few questions about the book. You’ve written a number of children’s stories now. Can you tell us the origin of these stories? Do you think of them on the spot and tell them to your grandkids? For years prior to starting to write children’s stories I used to ad lib stories for kids. When I would be around them, they would want me to make up a story on the spot so I would create a character and tell a story. I have a number of ideas for children’s stories written down that I review from time to time. These stories are designed to teach significant biblical concepts using foundational biblical texts that ultimately end up as the framework of a story. The Prince’s Poison Cup refers to the cup of God’s wrath that Jesus had to drink. This story is about Gethsemane and about the Cross. I am attempting to communicate the terrible price that Jesus had to pay for our redemption by being willing to drink that awful cup. Kids will relate to the story of The Prince’s Poison Cup because they have all tasted yucky medicine and had to learn that the ugly-tasting medicine will help them to be made whole. We jump from there into the concept of being ultimately made whole. Correct me if I’m wrong, but I think I’ve heard you say that The Priest with Dirty Clothes is among the most important books you’ve written. You are a gifted theologian and a prolific author of books for adults—what compels you to write books for kids restating biblical truth in an imaginative way? Yes. I have said that several times. Ultimately, my target audience in a children’s story is the parents who are reading the stories to their children. My children’s stories are designed to teach significant biblical concepts using foundational biblical texts that ultimately become the framework of a story. To communicate difficult abstract concepts like imputation in The Priest with Dirty Clothes, and to do it in a parable-like way, makes it easy for people to understand. The exchange of clothes as the climax in that story is a very effective image to communicate what imputation means. You are enormously gifted at explaining complex truth in a compelling way. Do you have any counsel for parents and teachers for how to do this well? I usually like to build a story on real life situations. The Lightlings, for instance, talks about a child who is afraid of the dark; afraid to go to bed at night. That becomes the springboard into the book. What age group is targeted in this book? 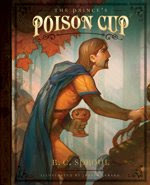 The Prince’s Poison Cup is written for children ages 3-7, though older children will also benefit. And as I’ve already mentioned, I’m really interested to reach the parents of those children. Is it easier or more difficult to write for children than adults? It’s easier. You can let your imagination roam completely free. Fairy tales and fantasy stories mesmerize children, much like what C.S. Lewis has done by telling simple stories to communicate complex truths. It’s something I like to do. Who is the character Ella Ruth in The Prince’s Poison Cup? She is my great-granddaughter. I try to include my grandchildren or great-grandchildren in all of my stories because it has a particular significance to them. What is the message that you would like to give to parents who purchase this book to read to their children? In this day and age, the whole need for atonement is being ridiculed widely, not just in the liberal church, but it has made its way into the evangelical community as well. People are saying that satisfaction involves God in cosmic child abuse. They ask why we can’t just rely on the love of God — that there is no need to satisfy His justice and His wrath. Through this story I want people to understand that the wrath of God is real. It was necessary to satisfy God’s righteousness in order for people to be healed. Instead of our receiving the cup of wrath, it was to be drunk by Jesus in His people’s place. That is absolutely central to the gospel.